Pulp and Recovery - Hydro-Thermal Corp. 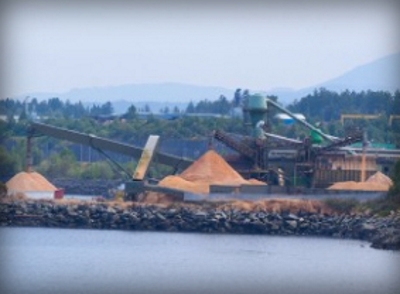 In today’s global market your pulp mill needs every competitive advantage possible. Hydro-Thermal heating systems will maximize your uptime with their minimal maintenance requirements and high reliability. The precise temperature control and non-scaling operation will improve your product quality and ensure consistency and production efficiency. Hydro-Thermal’s technology works by mixing steam and process liquids completely while delivering consistent temperature and instantaneous heating. For more information on our advanced direct steam injection technology, click here. The type of heater you need is dependent on how it will be used. 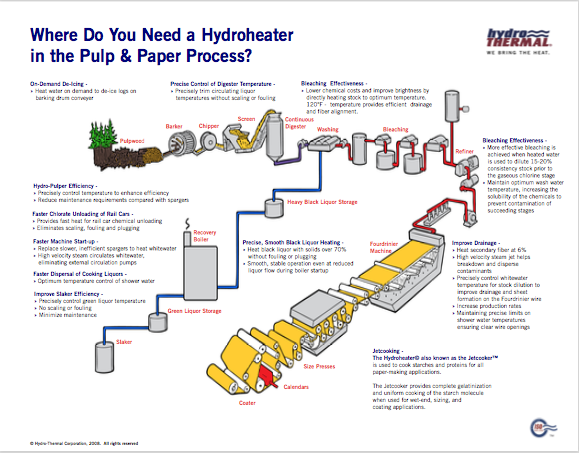 No matter what your application, Hydro-Thermal has the solution for every application in the pulp and recovery area. Stock and filtrate heating up to 13% consistency possible, as well as water/filtrate heating between bleach stages. Hydro-Thermal is working with a major European pulp and paper equipment company to offer the pulp stock heating application on a greater scale. The equipment company partnered with Hydro-Thermal for its technology and eventually private labeled a version of its Solaris Hydroheater equipment. Now, the second generation product line is marketed in conjunction with this company in the pulp and paper market. Therefore, any processors interested in this type of application will be directed to this equipment provider. Achieve best conversion and minimize risk of boil-over with controlled and precise temperature of slaker reaction during the causticizing process. There are multiple methods to heat green liquor including sparging into a tank, using a shell and tube heat exchanger, or doing nothing at all and having uncontrolled temperature. Using Hydro-Thermal’s solution increases causticizer efficiency, improves conversion rate of lime use, reduces dusting at lime kiln, and heats 100% of the process flow in line prior to the slaker. 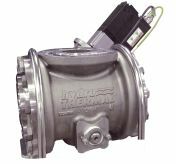 Precise and consistent temperature control allows for easy adjustment of liquor viscosity and efficient boiler firing. Black liquor is heated to achieve optimum drop size of the black liquor feed into the recovery boiler. If the drop size is too small, then emissions increase. If the drop size is too large, then liquor does not burn efficiently. Hydro-Thermal’s solution helps control droplet size, and can heat black liquor with solids over 70% without scaling or fouling. Combination of 317L and Duplex2205 alloys ensure reliable heating method that controls heating of the solution throughout entire unloading process. Up to 10-20% of product can remain un-dissolved in railcars and be returned to the chemical manufacturer if the water isn’t at proper temperature. Preheating water to 180ºF during the recirc process can remove nearly 100% of product in the railcar. By using Hydro-Thermal’s solution, you will eliminate loss of product due to inconsistent temperature control. In addition, maintain employee safety even if you are unloading highly corrosive and hazardous material. Hot water on demand to de-ice logs on barking drum conveyor. Improve shower efficiency through precise and consistent water temperature. Improve operation around the caustic/green liquor area of your facility.